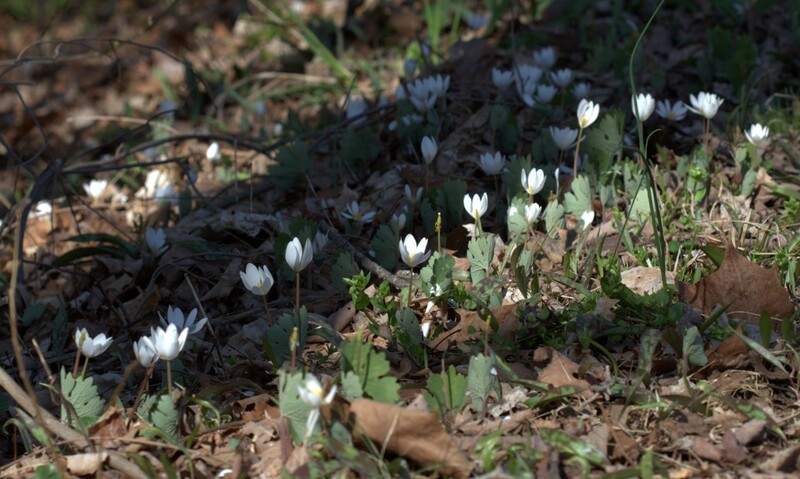 Bloodroot is one of the prettiest flowers you’ll find in the woodlands come Spring. Some may think it’s too simple or plain having only eight or so petals of white, but inspect it a little closer and you may come to think differently. In this photo I liked how the sunlight shined through the petals. Note water reflecting the sun’s ray on the upper right. This bloodroot patch grows adjacent to Little Buffalo Creek. 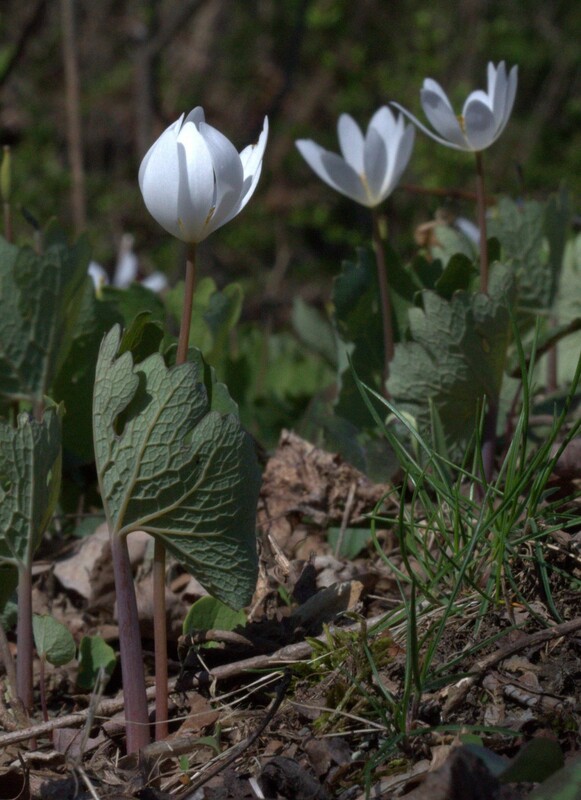 In the month of May Bloodroot, Sanguinaria canadensis, may be hard to find blooming as it usually flowers by the middle of April, at least in Central Pennsylvania. 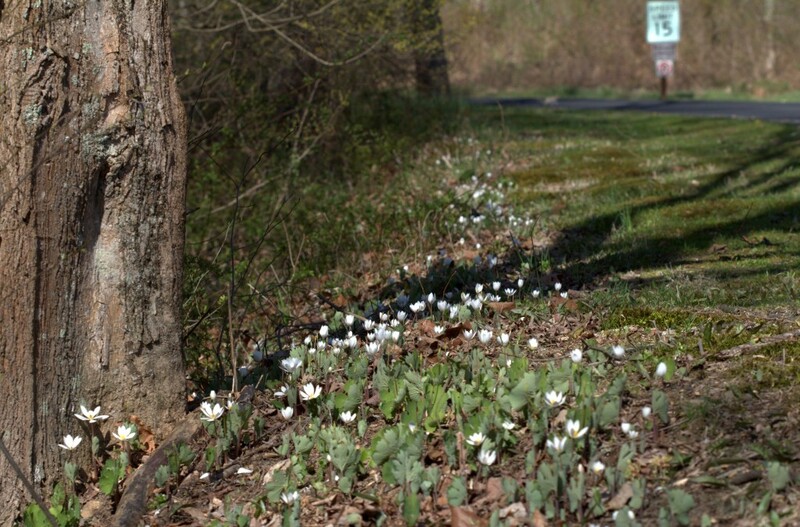 Areas to our south will see it bloom in very early Spring. In side view the small bloodroot flowers look like little tulips before they fully open their petals to the sunshine. When the flowers open their blossoms to the sun the many paddle-like yellow stamens can be seen. Note the filament of spider silk attached to the flower bud covering. As the flower matures its stamens gain length to become more threadlike. 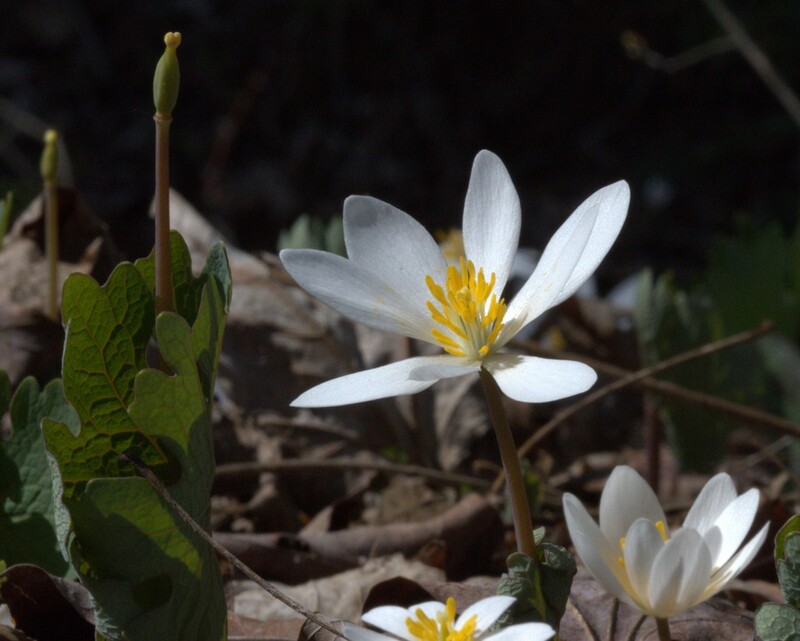 The single flower and the one leaf of bloodroot are formed before the plant emerges from the ground in early Spring. The delicate petals and structure of the flower are protected by an outer covering that envelopes them until its time to bloom. Flower bud has outer covering that protects the formed flower as it comes up from the ground. 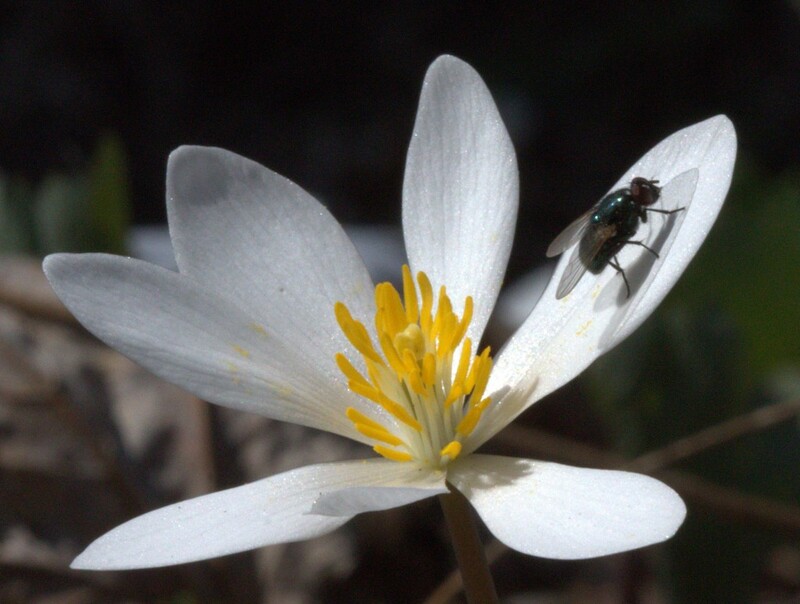 Flies are among the pollinators of bloodroot. Spiders, too. 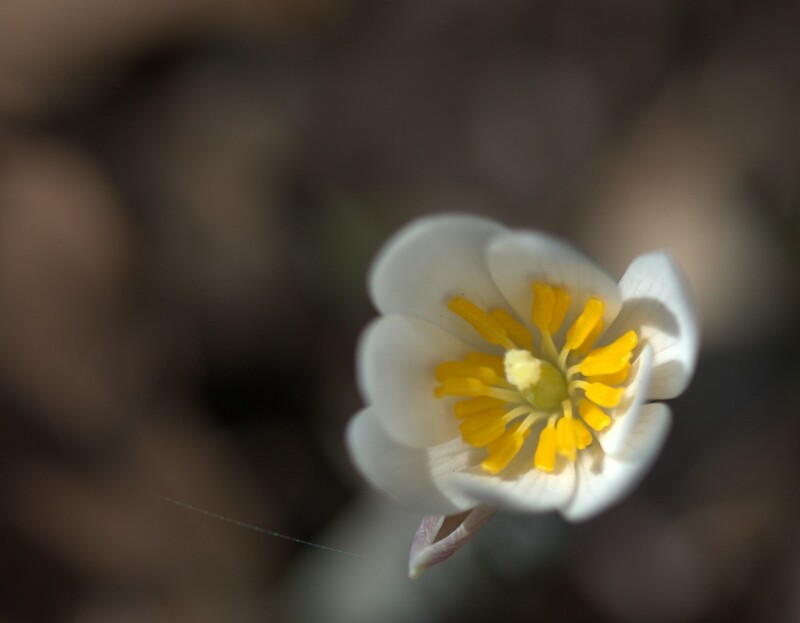 Bloodroot flower close up shows the pollen is being scattered by pollinators. Single leaf for each plant that arises on separate, thicker stalk than that of flower. 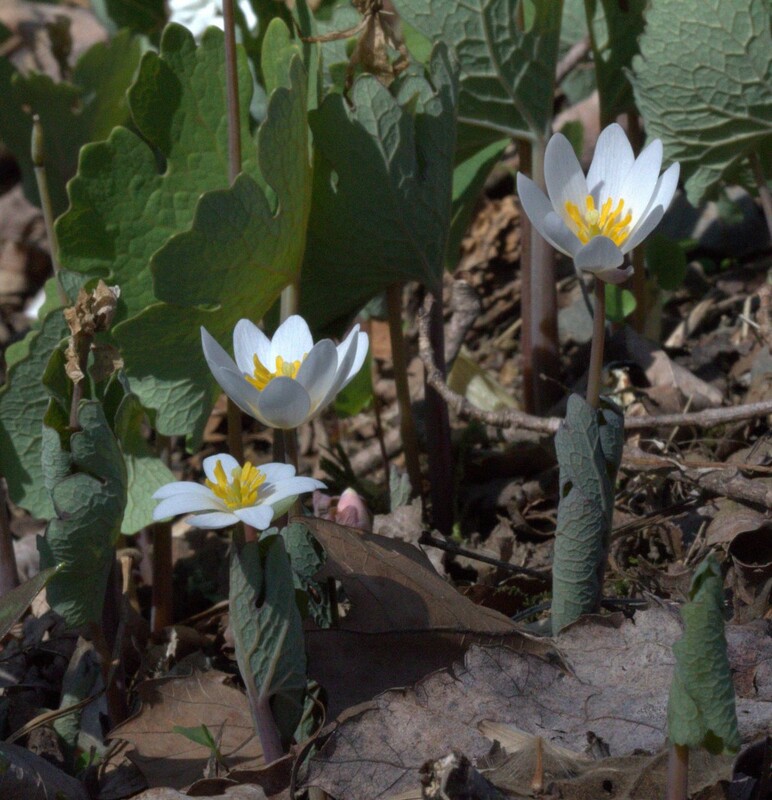 Spring beauty, coltsfoot and trout lily were blooming during the same time as bloodroot. Our Spring weather dipped back into very cold for a short time in April so many plants flowered and then paused growing. The bloodroot flowers may be showing an effect of the swinging temperatures as some can be seen as completely finished and holding their single green seed pod in the air, while other flower buds are still coming out of the ground. 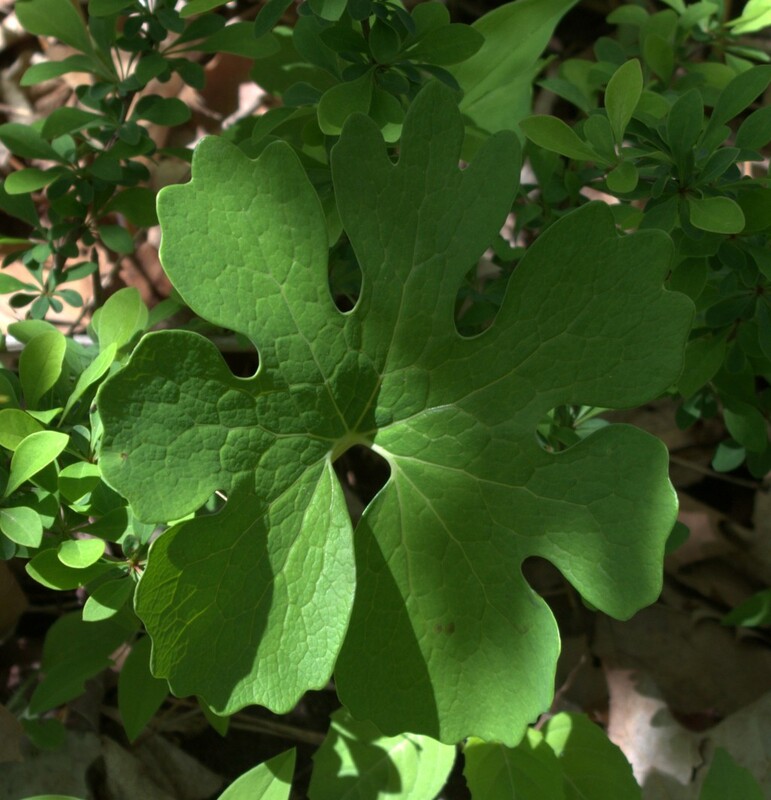 Bloodroot can be found growing near water. It likes to have its feet wet, so look for it near creeks, in lowlands adjacent to rivers, and in moist woodlands, especially in the valleys where runoff is likely to keep things wet. 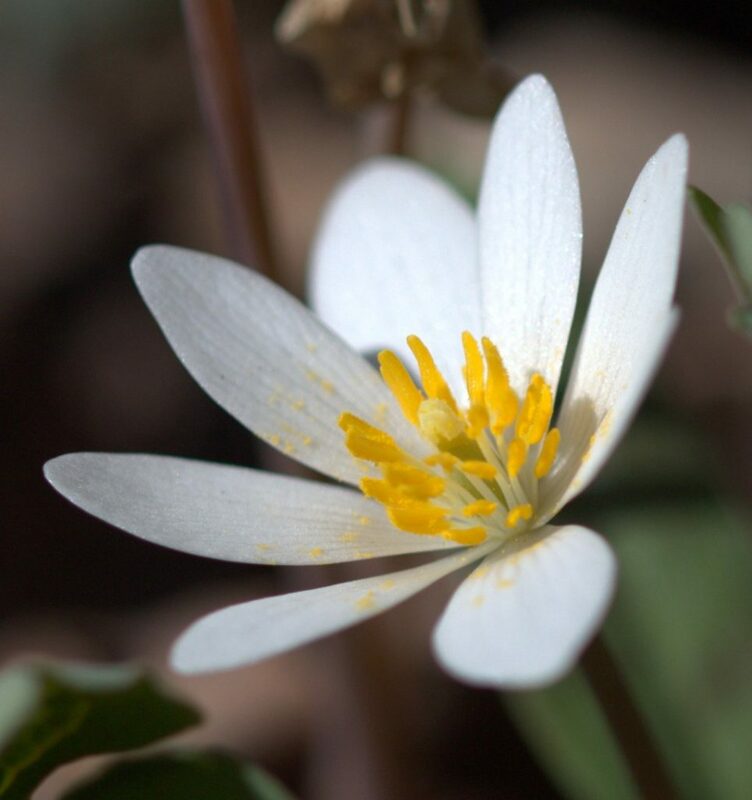 A handy location to see bloodroot is along Little Buffalo Creek which passes through Little Buffalo State Park in Newport, PA. As you’re driving to the Day Use Area check out the intersection of State Park Road and Boat Launch Road. Also, in the woods near the creek and along the Mill Race Trail are great places to find this interesting Spring Ephemeral flower. Now the plant can be seen as its oddly shaped leaves sticking up from the ground. Seed heads already may be slumped onto the ground, ready to spill their contents that may become next year’s generation.